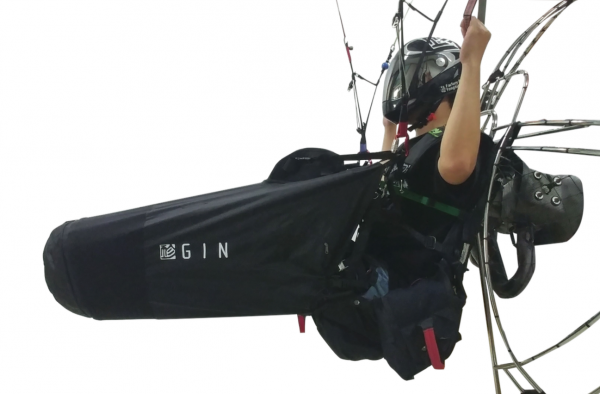 Since most paraglider pilots appreciate the advantages of a cocoon harness, GIN thought it was time that paramotor pilots should benefit from these advantages as well which is why the GIN’s Paramotor Cocoon was designed. 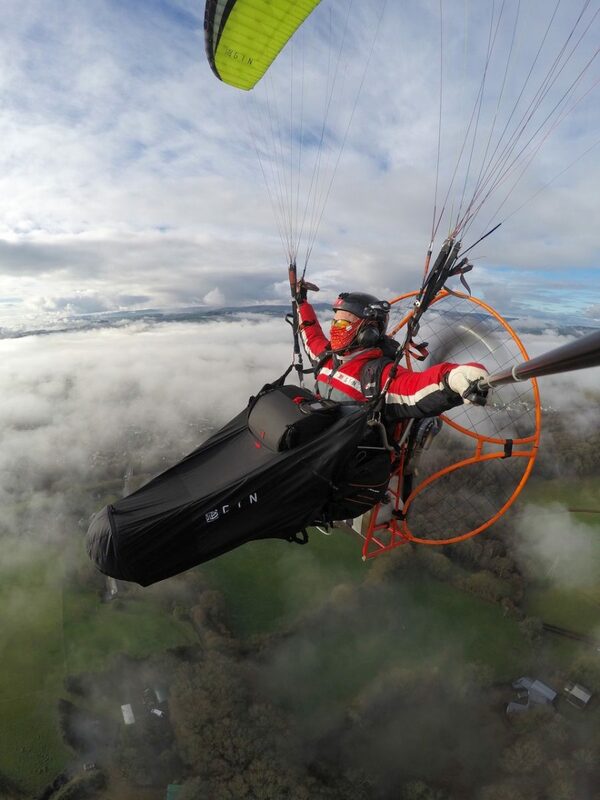 The GIN Paramotor Cocoon is intended for pilots who already have experience and who have mastered takeoff and landing with their paramotor glider. In flight, you will have to let go of a brake to be able to release the cocoon from it’s take-off position and to get into the cocoon and also for reposition it for landing. GIN Paramotor Cocoon ready for take off. 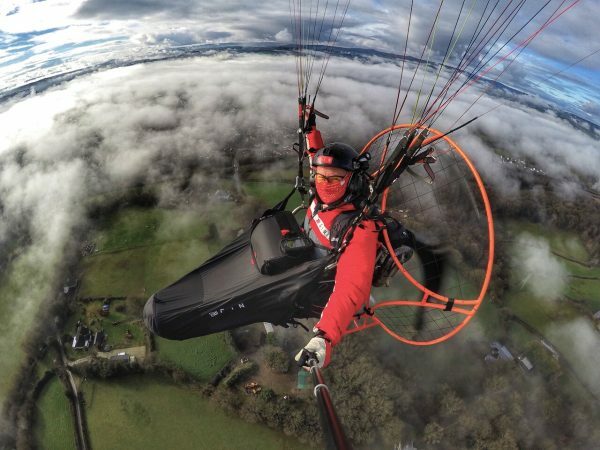 Paramotor factory pilot Laurent Salinas is the driving force behind the PPG cocoon. He spent countless hours testing prototypes and adjusting the design to meet the needs of paramotor pilots. The cocoon is designed to open at the bottom for very easy step in / step out. A buckle holds the cocoon during take-off to prevent it interfering during take off. The Cocoon has a large cockpit with integral flight deck with room to place phone and multiple instruments. With 10L of storage, the cockpit has ample room for all the things that are needed for long flights; lunch, camera equipment, instrument batteries, etc. 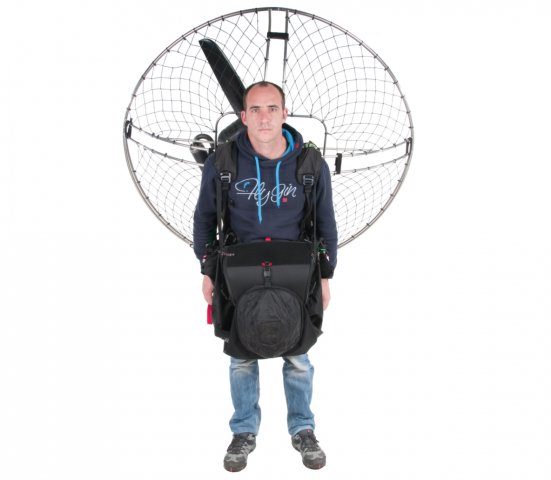 You can fit the to almost any paramotor harness and frames using GIN’s smart attachment system. Try one and you will immediately notice a huge difference in comfort. We received our first batch of Paramotor Cocoons last week and sent one off straight away to UK GIN Paramotor team pilot Dan Burton to try. He was up in the air within hours of receiving it and sent us the images used below. Easy on the ground – you don’t feel the weight of the deck as it’s supported. The flight deck sits high during launch and so doesn’t get in the way when taking off. Very easy to get into pod once in the air. It really works for keeping you warm – good protection from both cold and wind. He deliberately flew in light jeans and trainers and while cold on the ground once the cocoon was deployed he was well protected and warmed up. Dan’s now had several multi hour flights including a 3 hour flight in sub-zero conditions and was easily converted to pod flying. Loads of room for kit in the flightdeck, especially good for camera equipment and loads of room for instruments etc on the deck. GIN Paramotor cocoons are available through your normal paramotor dealer or from Dan Burton’s website or from UK Airsports.